You might enjoy this book if you like: Stories dealing with loss, female friendship, and/or autism. In an insightful, deeply human story reminiscent of The Curious Incident of the Dog in the Night-time, Daniel Isn’t Talking, and The Reason I Jump, New York Times bestselling author and neuroscientist Lisa Genova offers a unique perspective in fiction—the extraordinary voice of Anthony, a nonverbal boy with autism. Anthony reveals a neurologically plausible peek inside the mind of autism, why he hates pronouns, why he loves swinging and the number three, how he experiences routine, joy, and love. And it is the voice of this voiceless boy that guides two women in this powerfully unforgettable story to discover the universal truths that connect us all. I recently read Still Alice, which I quite enjoyed (as much as one can "enjoy" that book) and so, when this title by Lisa Genova came up as a possibility for our book club this year, I lobbied heavily for it. This book was pretty much what I expected from something by Lisa Genova (after reading only one other book by her!) and that is a good thing--the bar was set high! I really love Genova's writing style. It's very readable in that Genova has a very clear and descriptive, but not overly flowery or dramatic, voice. That being said, it is also not dumbed down or emotionless. I'm not the most in-the-know person about autism. I probably have no more than a baseline knowledge about it. Because of that, this book was almost educational for me. I do think it painted a clearer picture of autism than some other novels I've read. I think that is because of the format of this book. We don't begin to hear Anthony's voice until his autism, and the effect on his parents, is already established. I have frequently found in books where a character has a condition such as autism that the condition becomes almost a character in itself, and I don't think that is a good thing. 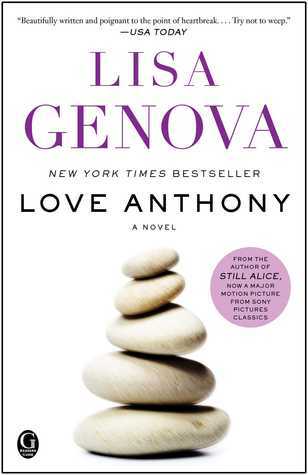 However, Genova makes sure that Anthony is the character, and autism is just part of him. One thing that surprised me about this book is, from the description, I expected this to be a female friendship novel--and there is that element, but not between to the two main characters, Olivia and Beth. I spent about half the book waiting for that, but once I realized that it wasn't really going to happen, I was almost relieved. I think the fact that the arcs of the two main characters are almost completely separate is not only unique, but also extremely effective. I think that, if Genova had merged the two stories, it would have watered down both. There is a point in this book where the reader needs to make a choice to either roll with it or be skeptical. That choice is up to the reader and their own beliefs and I can only talk to my own choice (which was to roll with it), but because of that, I found this story especially bittersweet. I felt that while Genova's choice here was risky, it did pay off. And...that's all I'm going to say about that. 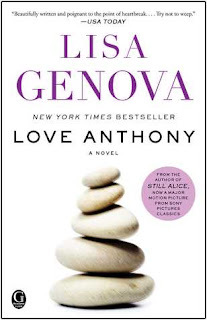 Genova has quickly become one of my favorite authors and Love Anthony delivered on all levels for me. I would recommend this to just about anyone.